A few days ago, a wonderful, beautiful event took over the streets of NYC: the Art Parade! 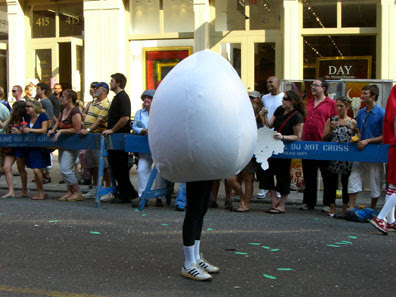 This was the first photo I saw on This is Love Forever's flickr stream: a person in an egg costume. Those legs! Ha! Now that, my friends, is why everyone loves a parade. Creative, fun, hilarious, fantastic. I wish all parades were less about corporate sponsorship and men with bagpipes and, instead, more about celebration, costumes and creativity. C'mon Santa Claus Parade, it's time to step up! 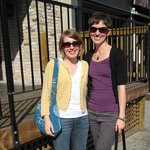 Magpie & Cake is a Canadian blog about crafting, music, and other wonders. It's written by Siobhan and Lindsay, two crafty girls with three provinces between them. 7 Deadliest Halloween Recipes... Owls!